Well, the first complete draft is complete. After almost 4 years of floating ideas around in my head I've came to some decisions. It's been tough for me as my main concern has been: what message do I want to convey to my audience that they will understand. This has been the motivation for my short film Untitled for now. I think it's a bit humorous to refer to it as Untitled. Anyways, a little history is in order as I've only sketched it out on paper and have no easy way to transmit it to the computer. I was doing some sketches one day and came up with a everyman character that I really like. My idea was a cosmic hero with humility and wisdom. Someone everyone can look up to and relate to. Well it was perfect to me when I first designed him with hollow eye sockets and a basic mouth. After joining Animation Mentor I realized I should make a short film, and what else than an original short? I decided I could use my character 'Veet' which is actually part of his name, which was made by jumbling the letters of "question everything" around. As my animation skill progressed I decided to change Veet because his blank stare just wasn't enough for the audience to relate. Having no eyes really limits the emotional attachment as I've learned. I started drawing, and drawing. 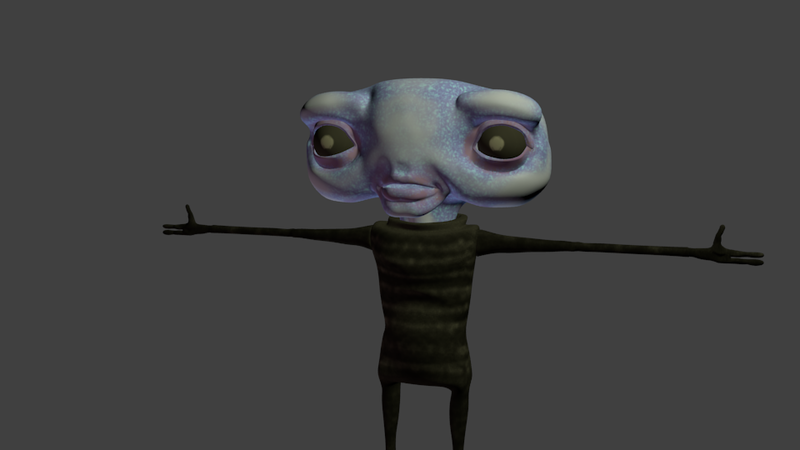 Then I began modeling in Blender. I ended up trashing it and starting over in Wings3D. After much tweaking I ended up with what you see here. 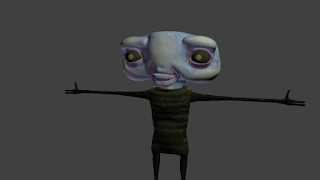 (Not final textures, just a test to learn 3d Coat.) He's came along way with the same basic idea from the beginning. But the story, that's the important part now isn't it? What's a character to do? These thoughts ran through my head off and on for years. Finally the other day I was thinking on one of my story ideas and the whole film played back in my mind! This was it, I was so excited I picked up some paper and began drawing non stop until I'd fleshed out the entire storyboard. Today I've been going through it refining it into more panel, adding detail descriptions, thinking about the audio and sounds I'll want. Camera moves, lighting changes, etc. I'm only on my 6th panel out of 54 but it's much more detailed. After this I'm going to make an animatic. Is anyone interested in the storyboard, or just the animatic?